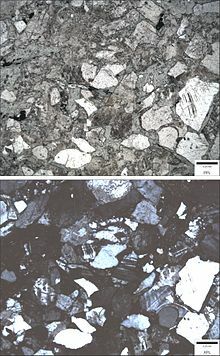 Photomicrograph of a feldspathic wacke (sandstone). Top image is in plane polarized light (PPL); bottom image is in cross polarized light (XPL). Blue epoxy fills pore spaces. 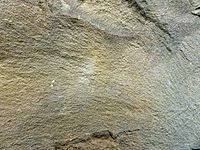 Photomicrograph of a lithic wacke (sandstone). Top image is in plane polarized light (PPL); bottom image is in cross polarized light (XPL). Blue epoxy fills pore spaces. ^ Baiyegunhi, Christopher; Liu, Kuiwu; Gwavava, Oswald (2017-10-28). "Modal composition and tectonic provenance of the sandstones of Ecca Group, Karoo Supergroup in the Eastern Cape Province, South Africa". 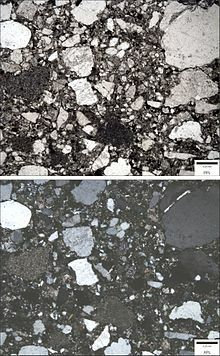 Open Geosciences. 9 (1): 491–508. doi:10.1515/geo-2017-0038. ISSN 2391-5447. This article incorporates text from a publication now in the public domain: Chisholm, Hugh, ed. (1911). "Greywacke" . Encyclopædia Britannica (11th ed.). Cambridge University Press. Wikimedia Commons has media related to Greywacke. This page was last edited on 4 February 2019, at 05:10 (UTC).